Formed in Bayreuth, Germany by classically trained keyboard player and multi-instrumentalist Andreas Hack, the band released their debut, “Personal Effects Pt. 1” in 2008 via Musea. The conceptual work about the tragic story of two sisters in a futuristic setting was inspired by films like Bladerunner and Ghost in a Shell. 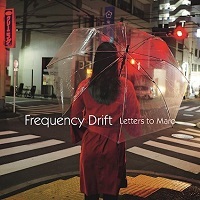 Since then, the band has gone on to release five more studio albums, and now present their seventh release, featuring new singer and lyricist Irini Alexia, titled “Letters To Maro,” which contains eleven new tracks. “Dear Maro” is the opening song; a letter of longing where some of the vocals are spoken in a storytelling method. The sound is sweet but turns dark as she talks about “falling through an ever-shifting ground. Cinematic elements occupy the instrumental passage near the end of the song. “Underground” uses Marco’s bass guitar and keys working with Irini’s pensive vocals to produce a dreamy landscape that begs you to get lost in, like the beckon of a warm blanket on a chilly day. “Electricity” is a more dynamic track, as the title might suggest. Several instruments open the track in layers. When the vocals come in the sound drops back a bit. The harmonic vocals in the chorus build a melancholic rhythm that is quit catchy. The atmosphere is warm and inviting. “Neon” moves along on a light breeze at times, and becomes bolder at times. The juxtaposition creates a welcomed contrast that gives life to the track. Mellotron notes are highly perceptible here, as are low thuds of bass guitar notes. What’s really great about this is that there are surprises around every corner. “Depravation” is a shorter track with plenty of emotion. It swells towards the end and finishes with a spacy sound. In Japanese mythology, “Izanami” is a Goddess of both creation and death. On this spectrum, I hear more hopeful than doleful sounds in the track, but there are moments of the latter. The gentle melody hangs in the air as something tactile. “Nine” moves slowly with a pensive sound that is expansive and at times perhaps a bit experimental. I love how the various layers work together to create something absolutely Progressive sounding but without giving up the core. “Escalator” is another song that is sometimes sung in a storytelling manner. The lyrics and vocals take center stage, but don’t miss what is going on in the background. “Sleep Paralysis” opens with a bit of a bite, but it soon subsides in favor of Irini’s introspective vocals, where she talks about wanting to be woken from a bad dream of sorts, where her body is asleep but her brain wide awake. “Who’s Master” is an extended, nine-minute track. Ominous piano notes lead off the track and there sounds like some foreshadowing. As other instruments join in, it builds in layers and haste and then drops off to just some sweet Mellotron notes, and another storytelling vocal section heavy with rhythm. “Ghosts When it Rains” is a three minute closing instrumental, that seems to sum up many of the roller coaster of emotions that the album is thick with. There is a continual struggle on the album between despair and hope; death and re-birth. The story is told in a large part through the expressive lyrics and vocals, and the music is wonderful in support. The album is bubbling with substance, which can often be a missing ingredient in much of the commercially successful world of music. It is poised, seductive, and charming and something that you can immerse yourself in.